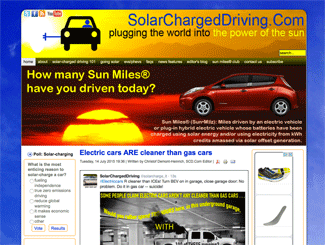 SolarChargedDriving.Com’s old look — with an Artisteer designed Joomla-based site. In case you haven’t noticed, we’ve got a new look! SolarChargedDriving.Com has been online since September 2009. Back then, we started with a custom designed template built by yours truly, Christof Demont-Heinrich, using the template building software Artisteer. We ran Joomla 1.5 as our core content management system (CMS) for the past six years [Joomla is now up to version 3.4]. I like Joomla, but, as a journalism professor teaching classes in which WordPress dominates, I’ve wanted to switch to WordPress for awhile. Well, I finally got around to doing the switch: SolarChargedDriving.Com is no longer a Joomla-based site, but a WordPress-based site built around a Cubell Themes Valenti WordPress theme. A special call out and thumbs up to Frédéric Gilles, the developer of a great Joomla to WordPress plug-in called FG Joomla to WordPress that helps you migrate your Joomla-based site to WordPress: I wouldn’t have been able to do the migration without Gilles or his plugin, especially considering that SolarChargedDriving.Com has more than 1,000 news articles, blog entries, videos, and photo galleries! The best part of the update is that SolarChargedDriving.Com is now mobile friendly, and, with somewhere between 30 and 50 percent of all web traffic now coming from mobile, and, with that number growing, you’ve simply got to be mobile friendly these days! Our look has been updated and changed, for the better, I think, but the content will remain the same: SolarChargedDriving.Com remains committed to being the best, most focused site on the web for covering, and promoting, the revolutionary synergy between solar energy and electric cars. In fact, six years after starting SolarChargedDriving.Com, I have yet to come across another web site that’s devoted solely to the EV + PV synergy and which has anywhere near as much multimedia content as we do!